We know how utterly draining it can get with all that hustling that you’re doing. 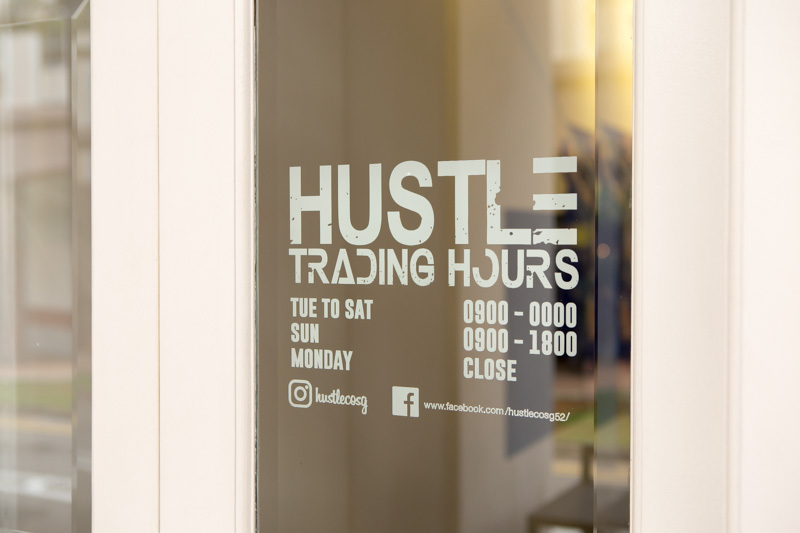 Hustle Co. ain’t gonna let those dreadful midweek blues get to you. 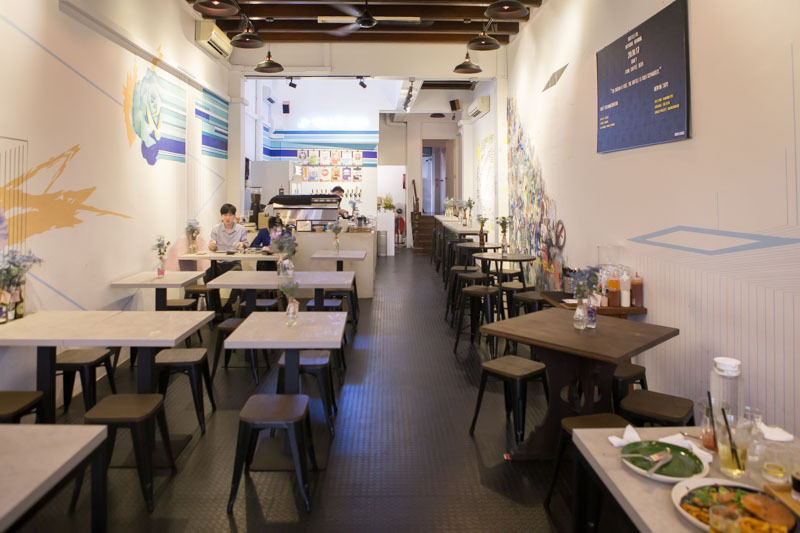 Located on Craig Road, this humble establishment is all about serving you your favourite comfort food. If you’re desperately in need of a breather and hearty portions to please your belly, this is perfect for you. And with an extensive menu featuring a comprehensive list of food and drinks for you to choose from, you’ll definitely find something to your liking. Everyone crazy about beer out there, you’re gonna love this. Why have regular commercial beer when you can enjoy an interesting mix of artisanal craft beers? 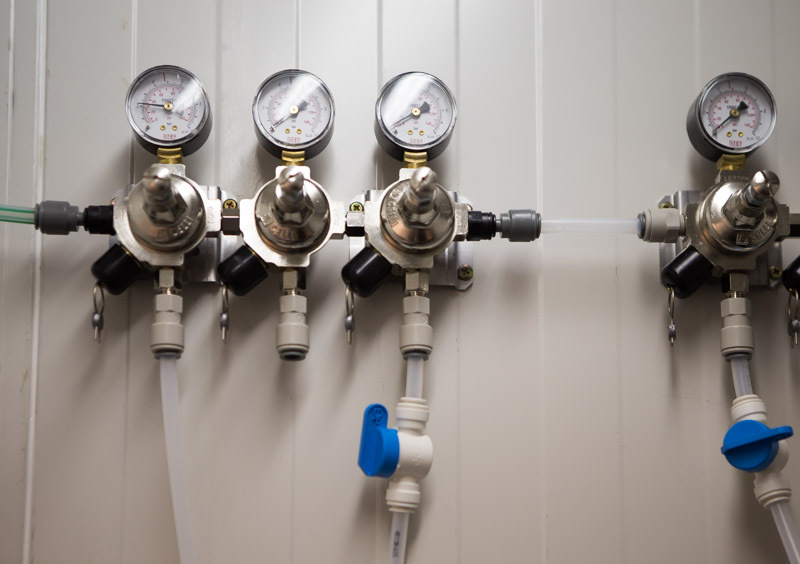 At Hustle Co., they take their beers very seriously. 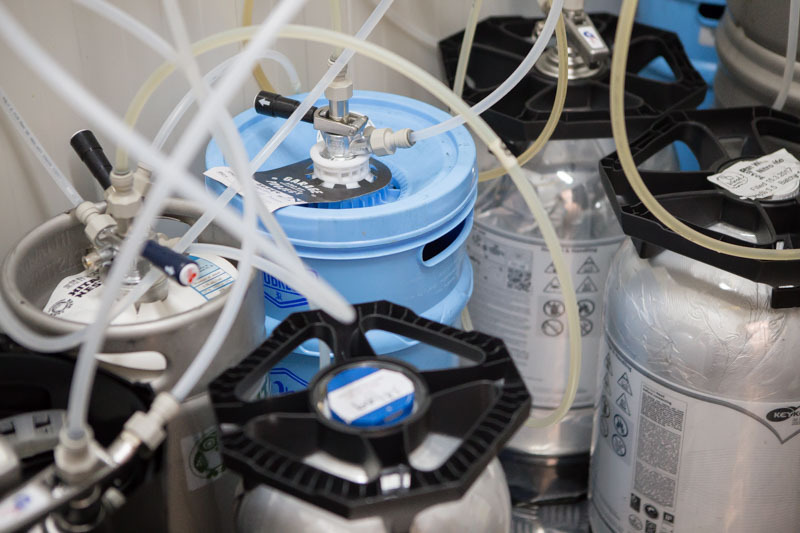 Craft beers can be very sensitive to temperature changes, and to ensure that they’re serving you the best beers in optimum conditions, they’ve even got their very own chiller to store their beers. That’s what we call sheer dedication. 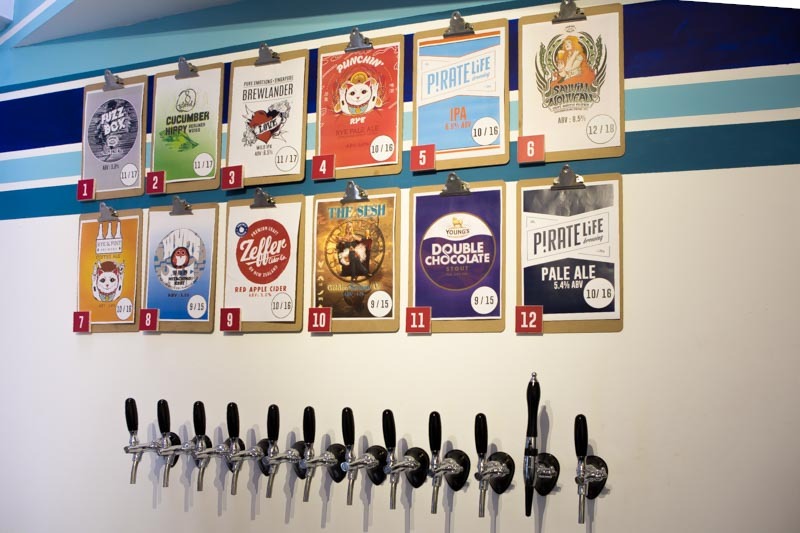 You’ll find 12 speciality beers on rotation (changed approximately every fortnight), so talk about a surprise with your every visit. We were so spoilt for choice and literally struggled to decide on just one. Which is why we got the Beer Platter ($25) instead, which comes with an assortment of five. 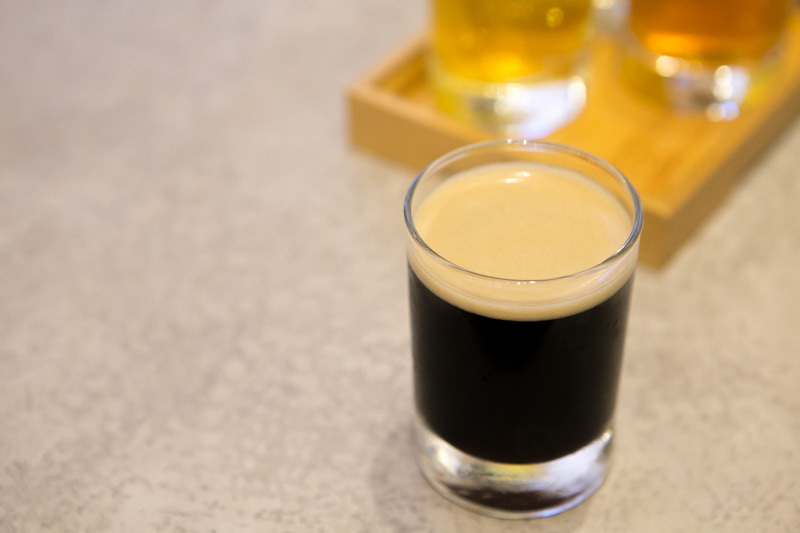 You can even opt for a beer tasting to find the ultimate craft beer for your palate. But what’s beer without some nibbles, right? 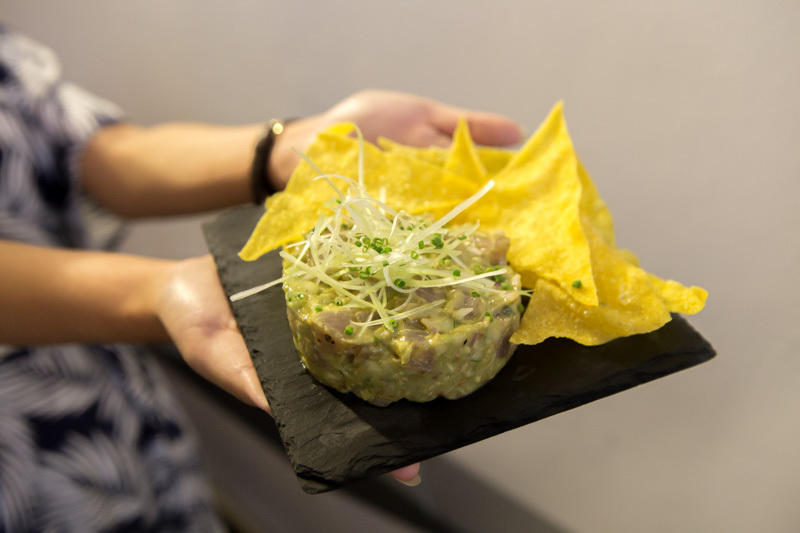 You might want to give the Tuna Tartare ($16) a try. Diced fresh tuna is paired with creamy avocado bits, crunchy cucumbers and a dash of homemade sesame dressing — the ultimate combination to satisfy your taste buds. In case you’re wondering, those aren’t tortilla chips but rather, fried wanton skin. We’re loving the little creative twists! Now, back to beer. The Punchin Rye and The Sesh Golden Session Ale were refreshingly light beers that went pretty well with the rich Tuna Tartare. As a palate cleanser, I preferred the Punchin Rye. The subtle fruity flavours in the light ale were right up my alley, but the slightly bitter aftertaste might not be for everyone. Otherwise, have The Sesh Golden Session Ale. This is a session ale (which means it is typically half of what you’d expect of a beer in terms of taste and alcoholic content). Novice beer drinkers will find this zesty beverage very much to their liking as it is smooth and easy to consume. Fancy a hearty meal that hits a home run? 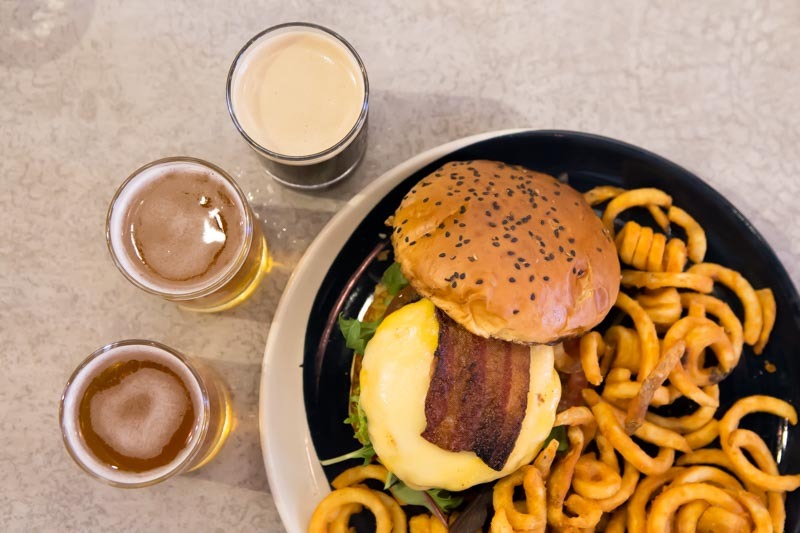 Go for the Bacon 3 Cheese Burger ($19) with Curly Fries (+$2). Dig into this wholesome meal with beer on the side. 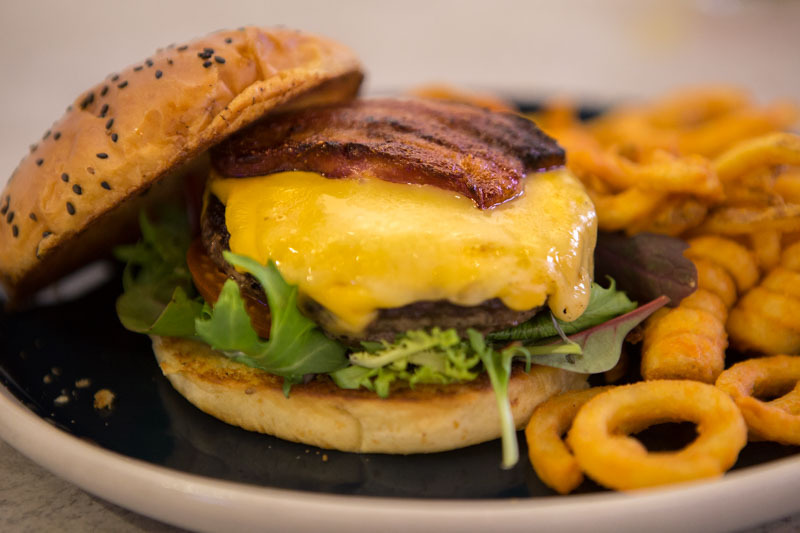 The warm, melty cheese that coated the dry-aged beef patty was topped with a crispy cut of bacon, creating a burger that oozed with juices as we sunk our teeth into it. The thick bacon slice really did add that little oomph to this dish. Another main that we really enjoyed was the Salmon Rosti ($22). 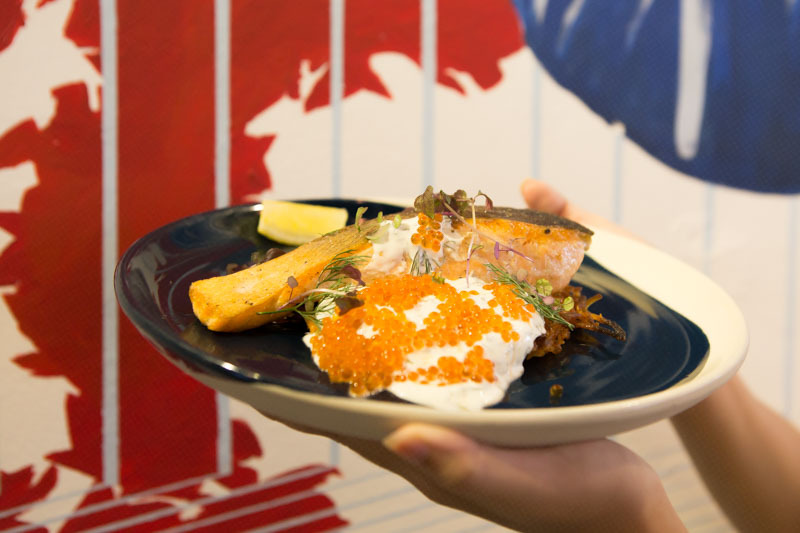 The golden and crisp potato rosti is paired with pan-seared salmon and a generous dressing of salmon roe on sour cream. The salmon was cooked to perfection with a crusty skin and slightly-browned outer layer, while the fillet itself remained moist and tender on the inside. 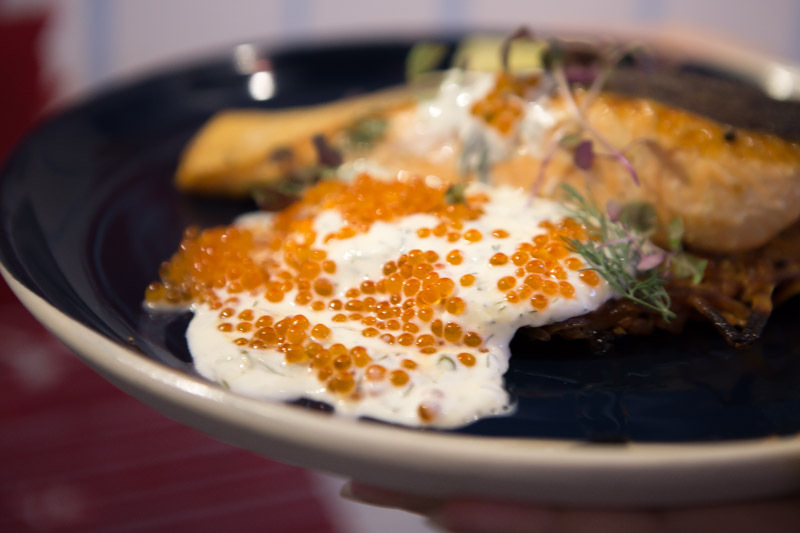 Feel the burst of oceanic flavours as you pop the roe in your mouth, adding a whole new texture to the dish. While this was pretty awesome as a whole, we did find the slightly charred ends of the rosti a tad bitter. 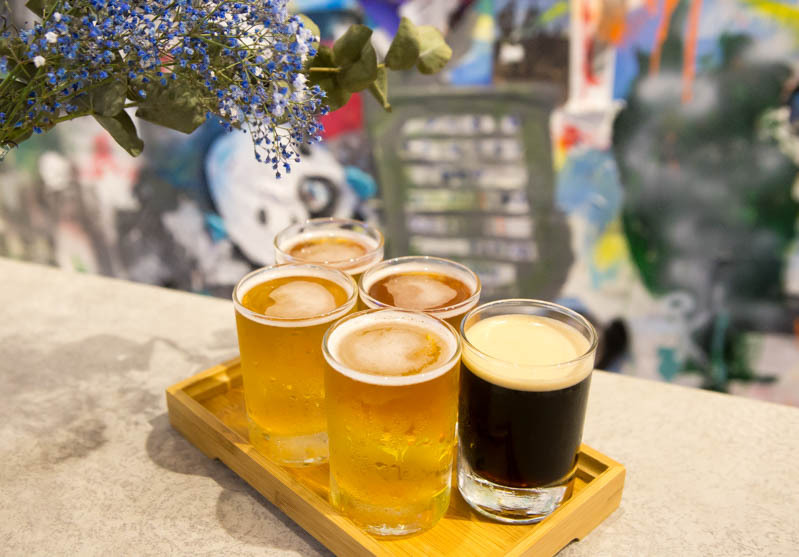 Besides the Beer Platter, we were recommended the Sauvin Nouveau, Hitachino Nest White Ale and Young’s Double Chocolate Stout to have together with our mains. The Sauvin Nouveau wasn’t what we expected in a typical beer. 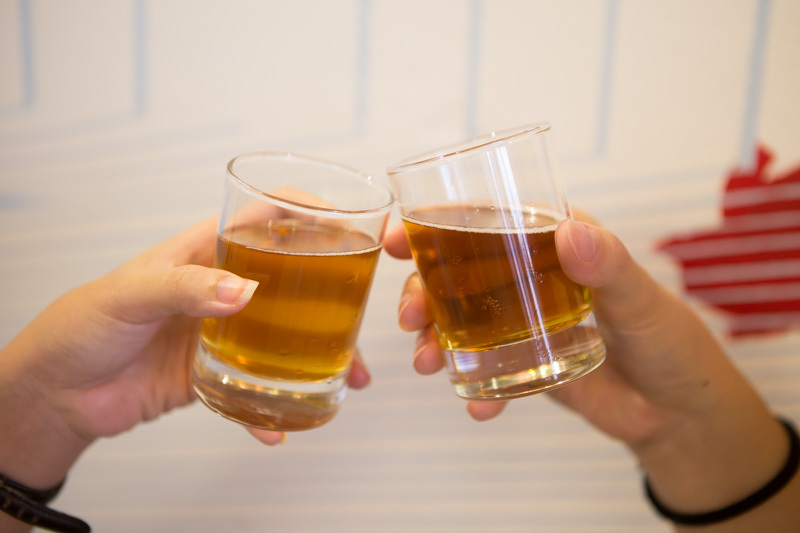 This unique concoction of wine and beer gave off a vibrant sweetness, similar to rosé wine but with more bubbles. The Hitachino Nest White Ale on the other hand, was somewhat similar to an Erdinger beer, with quite an intense aroma of spice. While we were expecting to be absolutely blown away by the Young’s Double Chocolate Stout, our expectations fell pretty flat, unfortunately. The taste of the chocolate was rather faint and instead, we were surprised by a mix of liquorice and herbal flavours. This beer might not have been for us, but it is still worth a try if you’re feeling adventurous! 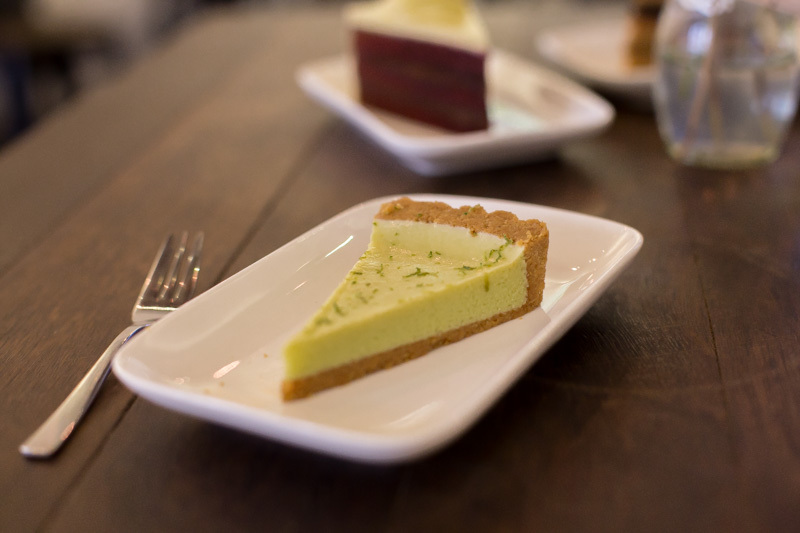 For dessert, the Lime Pie ($6) would be a great way to end off the meal. The tarty creation had a dense and moist crust that instantly crumbled in our mouths. If you’ve still got space in that beer belly of yours, try the popular Earl Grey Lavender Infused Chocolate ($7.50). 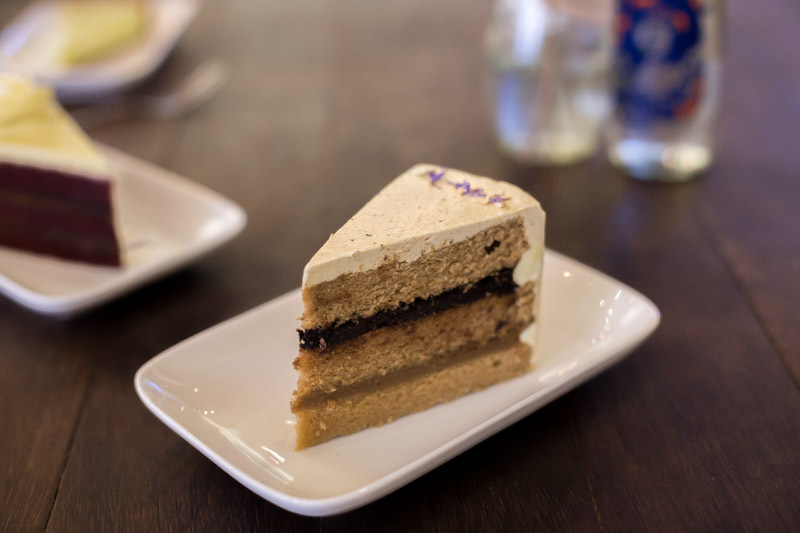 The lightly-flavoured earl grey cream with dried lavender petals will give you a sense of relaxation as you indulge in the fluffy sponge cake. Not a fan of beer? Take your pick from the cold brew tea selection. We recommend the Summer Passionfruit ($6.50) to pair with your desserts. 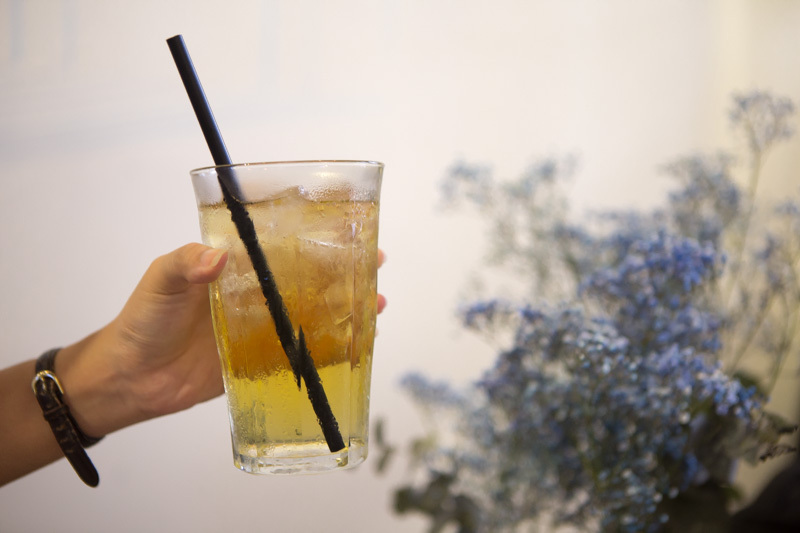 The pleasant mild sweetness of the chilled drink was extremely refreshing. 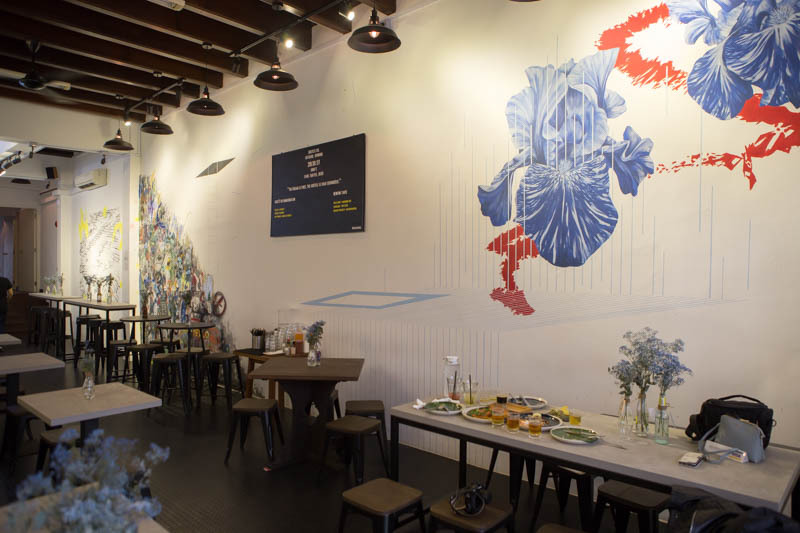 Throughout your dining experience at Hustle Co., you’re also bound to notice the unique decor on the walls. The works of art are actually all from local artists and entrepreneurs! 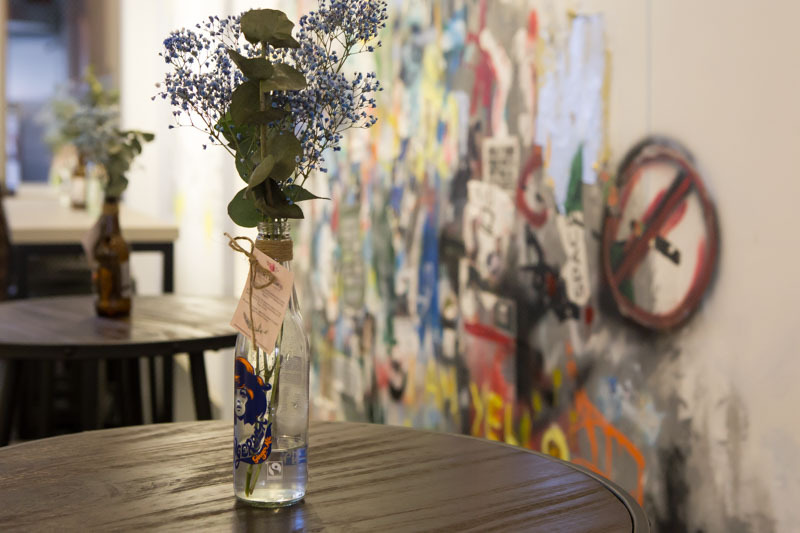 This cafe with heart is big on supporting the local business community. If you’re a budding artist looking to showcase your talents, simply get in touch and they’ll be glad to offer you a space for your craft. 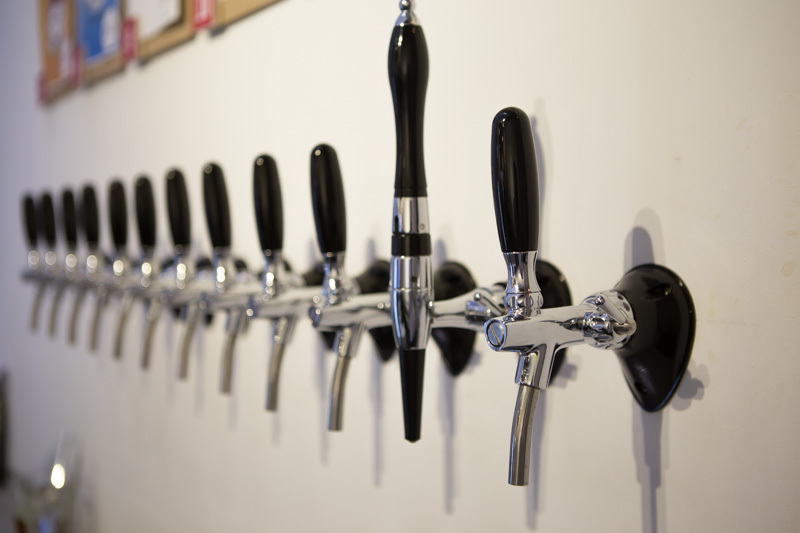 A feel-good space, beer and comfort food? Hustle down to check it out for yourself!